Our apps will help you pass the tests needed to convert your Transport Canada Pilot Licenses to FAA/USA Pilot Certificates. If you're a licensed Canadian Pilot and you wish you convert to an FAA pilot certificate, then you first need to meet a few legal and pilot experience requirements. Most of these pretty straightforward for Canadians - see AC 61-135A for details. Additionally, you will need to take and pass one or more FAA-administered, computer-based, multiple-choice conversion knowledge tests. Passing these tests is not easy, but it's also well within the capability of nearly all pilots. 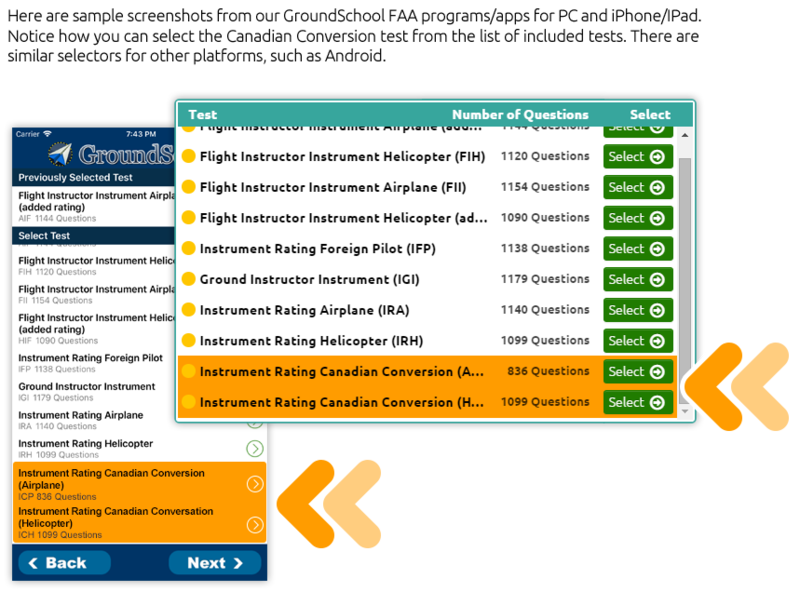 Our apps have helped thousands of Canadian pilots pass these conversion tests with a minimum of fuss and they can help you too. There are different tests for different certificates. There are also different tests for airplane vs helicopter. You may need to take one test or you may need to take several conversion tests depending on your specific situation and goals. During each test, you will be asked a few dozen questions from a total question bank of several hundred. This is less than the complete FAA question bank for a given certificate/rating, but it is still a substantial number of questions that you have to study. The tests are not particularly hard, but they do require at least a few nights of conscientious study. Our apps are 100% what you need to study and pass your necessary conversion tests. Q. What conversion test should I take? A. Once you know exactly which test you should take, our test prep apps are the best way to help you prepare for and pass the test. However, If you don't yet know exactly which test you should take, the first thing you should do is read FAA Advisory Circular AC 61-135A which outlines the process and options. If reading the document doesn't help you, you're best and most reliably served by getting answers to legal/career type questions directly from the horse's mouth - that is, from the FAA. Should you have specific questions beyond what is covered in the Advisory Circular, your best source for "bankable" answers is to call an FAA Flight Standards District Office and talk to an FAA representative about your situation - their job is to answer your questions. That said, in general, the actual test you will want to take is straightforawrd. For example, if you have a Canadian ATPL/IATRA license for airplanes and want to convert it to an FAA ATP certificate, you should take the FAA ATP Canadian Converision (Airplane) test. If you have a Canadian Helicopter Private Pilot license, you will want to take the FAA Private Pilot Canadian Conversion (Helicopter) test to convert it to an FAA Private Pilot Helicopter certificate, and so on. There are basically 8 "conversion" tests - Private Pilot, Instrument Rating, Commercial Pilot, and Airline Transport Pilot - each in both Airplane and Helicopter variants. Q. What about instrument ratings? A. There are separate airplane and helicopter tests to convert your instrument rating. So, you might need to take two tests, such as one to convert your basic license (such as Commercial Pilot Airplane) and one to convert your instrument rating. Again, check with an FAA FSDO to get canoncal information on this. Q. What apps of yours do I need? Private Pilot Canadian Conversion (Helicopter) exams. Instrument Rating Canadian Conversion (Helicopter) exams. Commercial Pilot Canadian Conversion (Helicopter) exams. ATP Canadian Conversion (Helicopter) exams. Q. But the above apps appear to be the prep for the 'full' FAA test. I just need the conversion test. A. Yes, no problem. The apps above contain preps for several tests each, including the Canadian Conversion tests. So, you get the for example Private Pilot app, start it up, and then on the screen where it asks you which test you want to study for, you select the Private Pilot Canadian Conversion (Airplane) test. The prep will then narrow down its question set to only those questions that in our experienced estimation apply to your test. Q. I did that but it still looks like several hundred questions. I thought the actual test was only a few dozen questions. A. You will only be asked a few dozen questions on testing day. However, those questions are taken from a bank of several hundred questions. Again, this bank will be smaller than the "complete" bank, but it will still be quite large. So, you need to study a few hundred questions. Q. I heard that the test only has 'Air Law' on it. A. That's not exactly right. The term "air law" has more or less a specific meaning in Canada, but it doesn't really have an equivalent in the USA, as "regulations" doesn't really encapsulate it. In reality, the list of things covered by the conversion tests is quite a bit broader than what a Canadian would recognize as "Air Law", even if that term had a specific meaning in a US context, which it doesn't. A list of things covered by the tests are listed below. While this list looks "specific", actually the terms in US/FAA use are fairly broad so the tests can and do include a wider spectrum of questions and topics than you might at first imagine. Note: all of these study areas are covered by our GroundSchool software. Appropriate air traffic services practices, communications, emergency procedures. FAA-H-8083-25, Pilot's Handbook of Aeronautical Knowledge. Appropriate air traffic services practices/communications. Q. I notice that for a given test you actually have three tests, such as "Private Pilot Canadian Conersion, Private Pilot Canadian Conversion (Airplane), and Private Pilot Conversion (Helicopter)." Which should I study if I want to fly airplanes? What about helicopters? A. In the past, for a given license/rating there was only a single unified test for both that were basically an airplane test. Now there are both airplane and helicopter tests given for a given license/rating. So, If you are right now reading this looking to study, you should ignore the "generic" one if you happen to see one and study only the airplane or helicopter one as appropriate (or both, if you need to take both tests). We have left the "generic" ones still in for the time being for users who started studying with that and who might still have saved sessions and other such things associated with the app. The generic one is basically the same as the airplane, and will probably be removed before too long. If you are already studying with a 'generic' one, there is no need to switch to airplane - even though there might be slight differences, they will be so slight that the change will be more hassle than it's worth. Q. Are your questions exact questions? A. In some cases yes, they will be exact questions. However, the FAA is serious about discouraging memorization. To discourage this, they regularly deploy question variants with different wording and answer choices. You should expect this. You should also expect a small number of 'new' qustions. Still, it should not be so bad. Why? Because our apps have the best, most detailed, and most illustrated explanations in the business. You MUST not just learn the questions, but also read through our explanations and really understand them so you will be prepared for whatever the FAA throws your way. Q. How do people do after studying with your prep? A. As far as we know, pretty much everybody who studies conscientiously for a sufficient period of time and who can consistently score in the high 80s or above using our prep no simulated tests passes their actual test with no problems. But, it does require the requisite study, so you WILL need to put the time into studying. Your general background in Canadian aviation, even if you've regularly flown in US airspace, will NOT generally be sufficient for you to pass the test. Use our apps, study hard, and in all likelihood you'll pass like thousands of our users before you have. Q. What platforms are your apps available for? A. Our preps are available for Microsoft Windows PC, Apple Mac, Apple iPhone/iPad, and Android. Due to the requirements of Google, Apple, and Amazon, each platform is purchased separately. So, if you want it for your PC and iPad, you'd have to buy it separately for each. This is not our policy, but that of Apple and the other app stores. Each platorm has exactly the same content, so the questions, answers, and explanations on each are IDENTICAL. Make sure after you get any app that you regularly use the in-app update to get the latest and greatest content. There is no one right answer as to which platform is the best to study on. This comes down to personal preference. For example, a mobile app may provide convenience in terms of portability, while some people feel that a PC or Mac desktop/laptop based app is the best for concentrated study. It's really up to you. Some people purchase the app on multiple platforms for increased study flexibility. A. As far as we know this requires that you take the Commercial Pilot conversion test. Please double check with the Advisory Circular above and/or an FAA FSDO. The same principle applies if you hold a higher license and want to get for example, an FAA Private Pilot certificate. Q. Do I need to give up my Canadian license to convert? A. No. However, having a US/FAA certificate can help your career in a myriad of ways. It's a very smart move, US pilot certificates do not have expiration dates, and it's a relatively low cost, low stress process with a lot of upside. But, you will have to study and pass the conversion knowledge tests. Q. Are the conversion tests given in French? Les examens sont-ils offerts en fran�ais? A. These tests are given by the USA FAA, not Transport Canada. As such, they are offered only in English. Les examens sont offerts par la FAA des �tats-Unis et non par Transports Canada. Par cons�quent, ils sont offerts uniquement en anglais. Q. Do I need to take both the Airplane and Helicopter tests for a given certificate/rating if I want to convert both? What if I want to convert a Commercial Helicopter and an airplane ATP? A. Please contact an FAA FSDO for such quetions beyond what is covered in the Advisory Circular above. A. Again, please consult the above Advisory Circular and then, if necessary, contact an FAA FSDO. They can provide you with the best, most official information that you need. Thanks for checking out GroundSchool. Good luck on your test, and blue skies!